Wayne Rooney believes that the communication — or, a lack thereof — between Jose Mourinho and his players was the biggest reason for the club's struggles this season, and eventually Mourinho's dismissal this week. Anyone who's ever watched a successful team interact and play together could see that the relationships between players and manager were anything but positive or productive. Speaking as a guest analyst on UK television (above video, with full version here ), Rooney explained why that failure to communicate was ultimately the undoing of Mourinho as United manager — particularly when he would chop and change the lineup from game to game, which he so regularly did in the final weeks and months. “The one surprise I had was that the communication with the players wasn't as much as it could have been. When you leave a player out of a game, sometimes it gives them a bit of freedom of the mind when the manager says, 'I'm leaving you out for this reason or that reason,' but the players didn't get that. 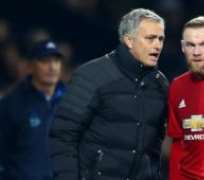 While Rooney doesn't believe any players well and truly quit on Mourinho — as far as not giving 100 percent every time they took the field — he admitted it was hard to ignore the night-and-day difference in the overall mood and commitment of the players during Saturday's 5-1 thrashing of Cardiff City , but that might just be down to the level of tactical freedom — or, again, lack thereof — afforded players within Mourinho's rigid style of play. “I don't think the players have gone onto the pitch (under Mourinho) and said, 'We're not going to give our all this game.' I know the was Jose plays. It's keeping your full backs close to your center halves, and keep two midfielders in from of the back four. As for Ole Gunnar Solskjaer , who'll serve as interim manager until the end of the season, Rooney was full of praise for his former teammate and mentor. According to Rooney, the Norwegian is more than just a happy-go-lucky character brought in to make the players smile again. “I think everyone looks at him from the outside (and think) he's just a nice guy, he's always smiling and he's always happy, but to do what he's done in football, he's got a lot of desire and hunger which a lot of people don't see. “I always remember as a young kid — the advice Ole gave me, I try to pass on to young players, especially when you're sat there on the bench, you're not happy and you want to be on the pitch playing. He always told me to watch the game, watch the defenders, to visualize what movement you're going to make to try to put yourself in a position to score goals or have an impact when you come on off the bench.